Cartoonist and artist Glen Baxter was first published in the Netherlands 40 years ago. Now he’s back with a collection of absurdist drawings covering all things Dutch – from herring and tulips to Mondriaan and Rietveld chairs. 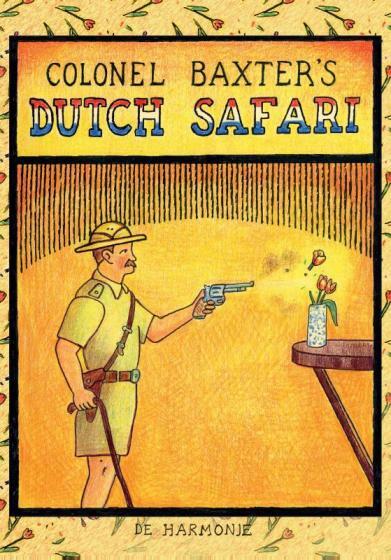 Dutch funnyman Wim de Bie, who curates the Glen Baxter Museum, provides the introduction to this slim volume of full-colour drawings and wry comments. In particular, Baxter seems to have it in for Rietveld’s famous chair – which is eaten by beavers, turned into a method of execution and a bidet. The humour is gentle and barbed at the same while the little Delft tiles sketched on opposing pages contain some hidden gems.